Has it changed from the past? Does it still make sense to dedicate many hours to what – at first – seems a very tedious and annoying task? Moreover, almost everyone asking me the last question inevitably adds this tagline: “However, now Google is semantic, and keywords are not so important anymore”. To be honest, that tagline is partly justified by the fact that Google, since the release of Hummingbird, tends to “simplify” the Understanding step of the Search phase, so that the meticulous work to find and monitor the largest number of long/very long tail keywords partly has lost its old sense and purpose. Does this mean that keyword research is useless today? My answer is no, and – as I will try to show and contrary to what many may think – the reason of my answer is Hummingbird itself. We SEOs optimize a site for it to be as visible as possible in search engines. This means that the sites on which we work should positively respond with their pages to as many queries related to the sites themselves and that users use. 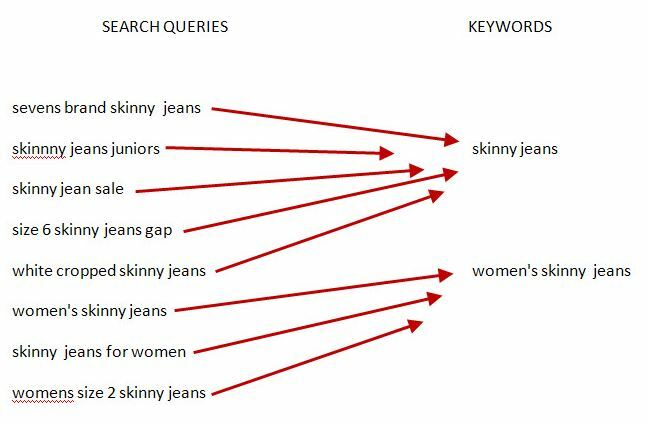 Queries are the actual use people make of the keywords. It is important to remember this difference, because since Hummingbird, as I said before, Google simplifies the Search phase of its algorithm, so if substantially different queries are satisfied by a common answer, then Google no longer will present as many SERPs as queries there are, but only one/few common to a larger groups of them. All this means that keyword research now is even more important and necessary than before. Keyword research has changed because, after Hummingbird, it helps us optimize our site on a semantic level, helps us decide our site’s architecture and segment site’s topics into thematic areas, which also consider what is commonly defined as “customer journey” of the visitors of the site itself. Keyword research has become more complex but, fortunately, there are many tools that can help us. What tools to use for keyword research? What follows clearly can not be regarded as the ultimate keyword research tools’ list, simply because it is the list of tools I use the most and, therefore, which I can speak about due to hands on experience. If you think that other tools should be suggested, you are free to do so in the comments. Keyword planner still is a great SEO ally when it comes to keyword research, but not so much for its most immediate function. Using Keyword Planner only to find out what search volume a keyword may have is not really useful anymore, because since August 2014 it is no longer possible to see the real search volume of “exact matched” keywords ([keywords]). 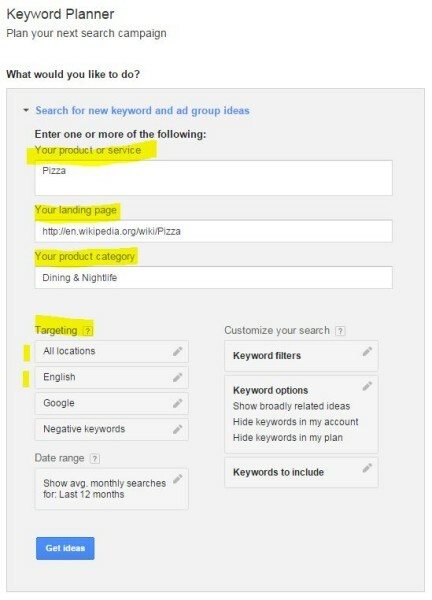 The real reason for using Keyword Planner now is that it helps us discover what keywords Google considers most relevant in relation to a page(s), that we ask it to analyze. We refine the targeting. In the example above I indicated “Global” as a geographical target and “English” as the language. The result is what we see in the screenshot below. The keywords by themselves are not the most important element, but the Ad Groups, which are groups of semantically related keywords. These groups tell us what keywords to use/consider when we want to optimize a page for given semantic environment. Furthermore, we can consider these groups as ideas for eventually structuring the content of a site, or a section, creating what I define as Topical Hubs. When we’re writing a query in the Google search box, it suggests some searches. These are not chosen at random, but correspond to the most popular searches we all do. In technical terms, Google retrieves the suggestions from the vast database of the actions of its users: the Knowledge Base. Why is Google Suggest useful? However, if they are indeed in Keyword Planner, these searches often have no statistically historic data so to present any search volume. Ideas to create pages/specific sections responding to those queries. Clues on how users relate our brand with respect to our competitors (e.g. with tips queries like “Brand” vs …). Pay attention and remember to explore the various Suggest while being in Incognito, because Google Suggest – like everything in Google – is strongly influenced by Personalization, so that Suggest in a neutral environment and Suggest in a personalized one can be very different. Finally, remember also that the Suggest feature is present in every Google vertical search (Images, Video …) and its other properties, such as YouTube. 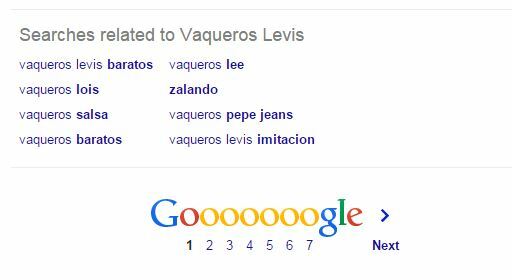 If we scroll down to the end of the first page of a SERP, we usually see Google present us searches related to the one we have just done. Google does it to help users refine or try alternative searches, which may better meet their needs. For us SEOs however, the real advantage is that Related Searches give us an idea of how Google relates searches to each other, so that we can create contents that respond to them and are linked together. We can try and build a Related Searches graph using as the tier 0 our main keyword/query, as tier 1 what Google immediately suggests us, as Level 2 the the Related Searches of the tier 1 and so on. 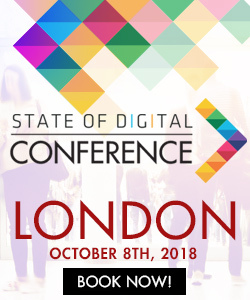 This way we have a complete overview of the search ecosystem as it relates to ours and also discover unexpected relationships that can suggest ideas to create original content (and substantially “rebuild” the never forgotten “Wonder Wheel”). What is the difference between Related Searches and Google Suggest? Related Searches are not necessarily real queries in the literal sense, but a grouping of thousands of queries under a common search concept. This is a very fresh feature, just discovered by Dan Barker, which Google is experimenting with, and that it can be considered similar to Related Searches but focused only on the Answers feature. 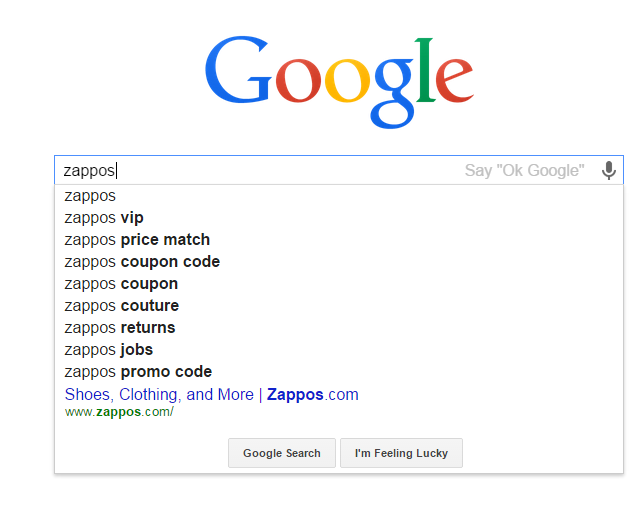 This Google feature is so fresh and maybe in testing still, so I was not able to replicate the SERPs Dan saw. 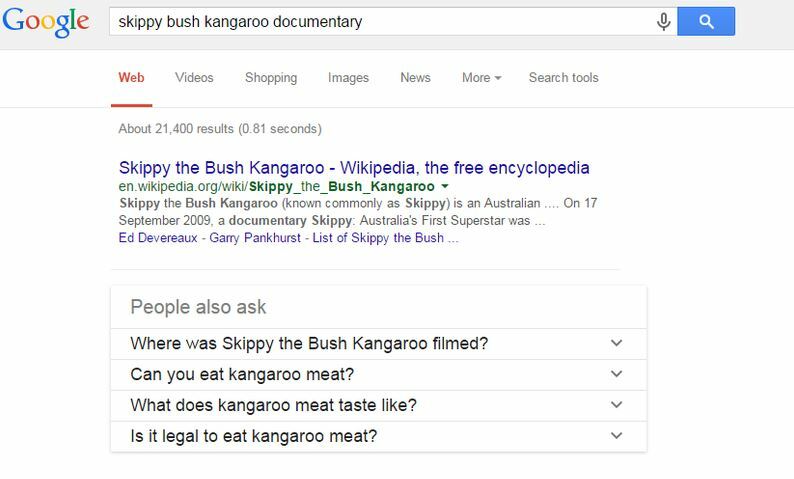 However, it is quite easy to understand how “People also ask” could help our keyword and topical research. Unfortunately, Google Trends is a tool that SEOs typically use little and poorly, limiting its use to the discovery of – excuse me for the redundancy – trends and therefore, as a system for discovering topics about which to create Content Marketing campaigns. Google Trends however, can be very useful when we are doing a Keyword/Topical Research. 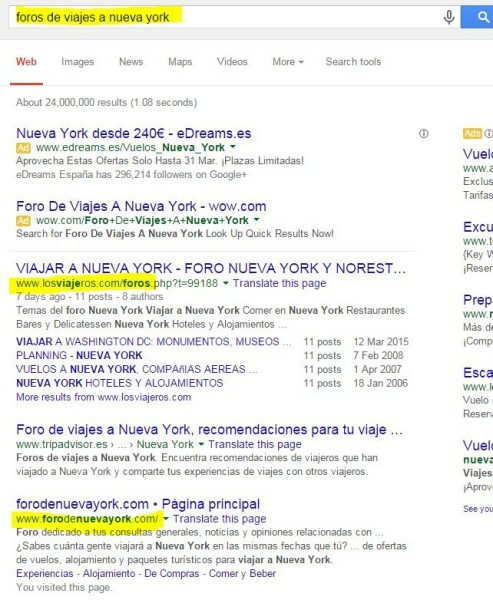 A first example is when we do International SEO and our targets are countries that share the same language. 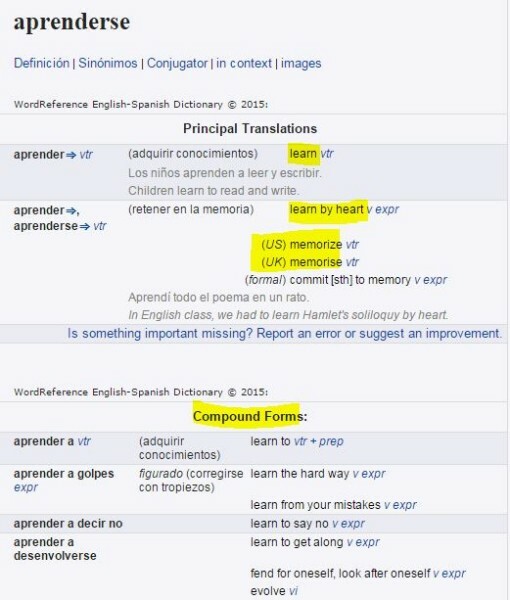 It is quite known how the Spanish used in Spain is very different from that spoken in Mexico or other Latin American countries and how it is possible that different expressions are used to talk and search about the same thing depending on the country. Thanks to Google Trends, we can easily find out what search term is used depending on the country. 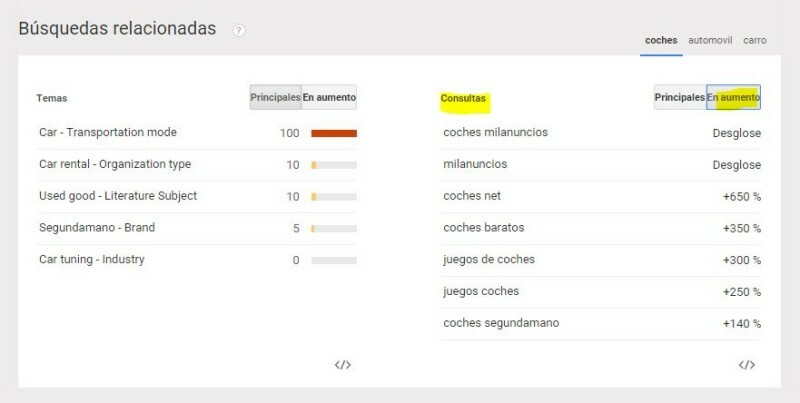 In the snapshot below, for example, we can see how “coche” is more used in Spain than in other Spanish-speaking countries, which, in turn, are more common terms like “carro” or “automovil”. Even more interesting is that Google Trends helps us discover new searches that, because of their “freshness”, usually are not even presented by Google Suggest: the “Breakthrough”. If we open Google Webmaster Tools and click on Search Traffic > Search Queries, we can see for what queries our site had been visible in the SERPs over the past 90 days. Optimize them improving the quality of its contents and elements like Meta Description and, if applicable, its Structured Data in order to improve the Click Through Rate. There is no better source of keywords that users themselves of our site. For this reason, and with even greater reason since Not Provided, having a good site search is critical. Google Site Search is, in this sense, a very good tool, which allows us to find out which keywords/queries our visitors are using for refining their searches once landed in our site. Obviously, this is not the only function a tool such as Google Site Search offers, but for the specific needs of keyword research – and thanks to its natural integration with Google Analytics – it provides us with valuable insights especially for understanding which keywords are used depending on the phase of our users’ customer journey. The keywords that our competitors are visible for are keywords for which we in most cases, want to be (more) visible too. Apart from relying on the Keyword Planner using the method I suggested earlier, there are tools that allow us to discover our competitors’ keywords more easily. The most widely used tool is SEMRush, but another that offers great results is SimilarWeb, which allows us to explore who are the market leaders in our niche and what keywords they are visible for online. As you can guess, SimilarWeb is especially useful when working for a site that has yet to launch or to discover what are the competitors and their keywords in different markets than ours, if we are planning an International SEO strategy. In addition, SimilarWeb allows us to segment search on vertical engine (Universal Search, Images, Video, App Search …). Please remember that when I talk about tools I never refer to using them in exclusivity. Experience has taught me that it is better to combine the use of two or more tools integrating their functions and their distinctive peculiarities so to obtain the best result. Therefore, if you have the opportunity, ideally use tools that provide also APIs, so to can create our own tools, or being able to use tools like SEOGadget for Excel by BuiltVisible. Doing keyword research now looks more like studying the language of a tribe (our audience) than simply individuating what keywords have the highest search volume. Therefore it can be very useful to use unusual tools in this type of activity. Scraping is useful for discovering the jargon used in some niches. Analyze the search volume of the discovered words. Wordreference.com is the online dictionary with the most powerful community that exists on the Internet. Its community makes it the most useful for understanding the real meaning of words, their colloquial usage and also all the synonyms and antonyms a word may have. This is especially useful if we are doing a keyword research in languages different to ours, or territories where our language is spoken but with strong local variations. Social Mention and Topsy are monitoring social conversations tools, and are valuable also to discover colloquial forms, especially if our target is young. Again we will resort to scraping or on using APIs and Excel to collect the information, then refining that information to extract keywords and phrases used in social networks in relation to the product/service/item for which we are conducting a keyword analysis. On the Internet is easy to find thematic dictionaries, which can be of tremendous help to very specific niches. 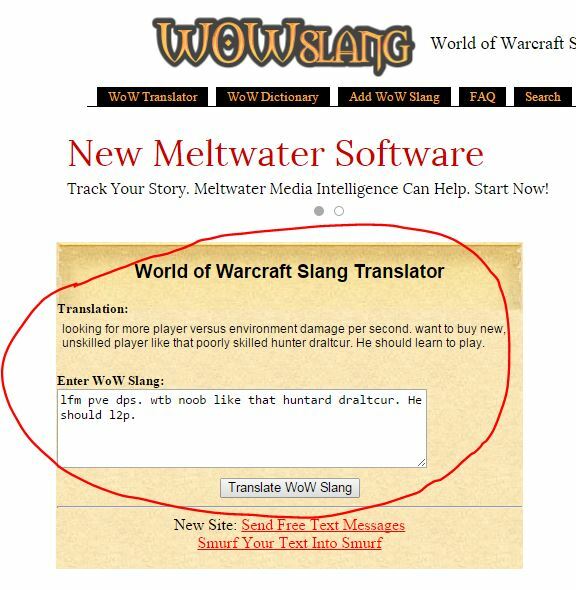 Is our site targeting players of World of Warcraft? There is an online dictionary exclusively dedicated to that: WowSlang.com. Finally, note that on web sites like Quora we can also find valuable information in this regard, as is the case in this thread where the most common jargon terms that neuroscientists use are presented. Over to you: Do you still think that for doing good keyword research we just need Keyword Planner? Gianluca Fiorelli is an SEO and Web Marketing Strategist, who operates in the Italian, Spanish and English speaking countries market. He also works regularly as independent consultant with bigger international SEO agencies. Excellent, Gianluca. I’ve had this discussion with several colleagues who insist search has changed in as far as being more semantic. I like you, still contend that regardless of the tagline “However, now Google is semantic, and keywords are not so important anymore” you still need to research the value/volume/relevance of the primary keywords. Punto, basta! Quite basic if you ask me, was expecting a more in-depth article. Great article Gianluca. It helps a lot especially to beginner’s in SEO and non-SEO specialists. Thank you – Gianluca Fiorelli. This is very help full even for advanced SEO experts. 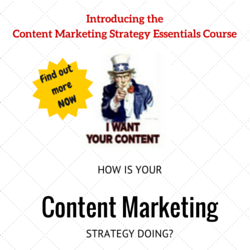 The keywords are the building block of website content also the main driver of the traffic. We better work on product and services that are needed by the crowd and crowd generates the key phases. Thanks for the good knowledge on SEO, it’s like a simplified PhD in SEO, i will do my best to apply all. Thanks Gianluca, for your time to write such useful article. I was very confused about Keywords Research before, but this article have helped me to understand more about it. I am giving SEO Services, and have wrote some SEO tips blogs too. This article has increased my knowledge.